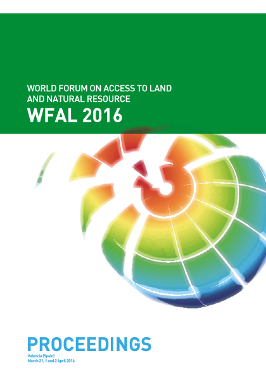 The meetings of the Global Forum on Access to Land and Natural Resources (WFAL 2016) took place over three days of work, discussions in the form of plenary sessions and workshops held from 31 March to 2 April 2016 on the campus of the Polytechnic University of Valencia in Spain. It brought together representatives from three categories of signatories of the WFAL call, with the majority present being from rural organizations and rural civil society (organizations of farmers, fishers and forest communities) and urban civil societies from around the world, especially women’s and youth organizations. These organizations have worked and discussed with other participants, researchers, representatives of local, national and international governmental institutions and representatives of other actors under the modalities established by the International Organization Committee. These organizations and individuals come from 70 countries in Africa, Asia, South and North America, and Europe; They collated analysis of rural development in recent decades and its impact on cities; They identified policy measures to solve the problems that constitute these developments and generated effective citizen action for political change and reversal of the serious tendencies observed. This document constitute the minutes of this meeting. It facilitates the meticulous transcription of the exchanges between participants during the plenary sessions (introductory presentations and debates) as well as a summary of the thirteen workshops in sub-groups. This has been prepared by the Permanent Secretariat of WFAL, supported in turn and since 2014, by the Association for Improvement of the Governance of Land, Water and Natural Resources (AGTER, France) and the Centre for Rural Studies and International Agriculture (CERAI, Spain).